Across Iowa, it's people who are building a new green infrastructure to improve water quality. 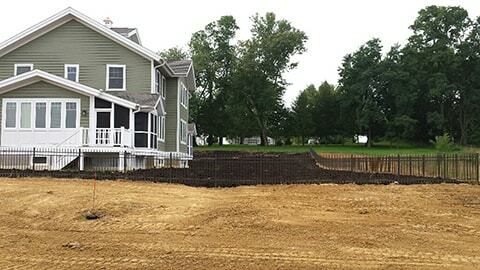 Across Iowa, it's people who are building a new green infrastructure to improve water quality. People like landscaper Lucy Hershberger. Hershberger took a Master Conservation class and collaborated with North Liberty city leader Tracey Mulcahey on a state grant program to restore lawn soils. People like farmer Dean Sponheim of Nora Springs. Sponheim wdescribes himself as an “accidental environmentalist,” who discovered saving money with strip tillage also saves soil. Today, Sponheim is the point man for an array of new services farmers are using in the Rock Creek Watershed Project. As farmers, soil scientists, engineers, pilots and a myriad of other experts implement the Iowa Nutrient Reduction Strategy, economic opportunities are unfolding in Iowa’s communities. This article is the first in a two-part series that highlights examples of why a host of Iowa leaders have joined IAWA in a Conservation Infrastructure effort. Over the next 18 months, teams will be working to uncover other opportunities for improving water quality – aligned with the Iowa Nutrient Reduction Strategy – and to identify the economic development opportunities that come with it for Iowa’s farmers, businesses and communities. In the spring of 2016, landscaper Dan Harbit struggled to meet the demand for lawn renovation in North Liberty, a small Iowa city of 19,000. At each yard, his workers used a deep tine aerator set at a six-inch depth. Then they spread a half-inch of compost over the lawn and worked it in. “We brought our equipment in and would just go straight down the block,” recalls Harbit, who shared the work with four competitors at 200 homes and condos. They raced against the summer heat, when temperatures above 70 degrees can kill grass under the compost. 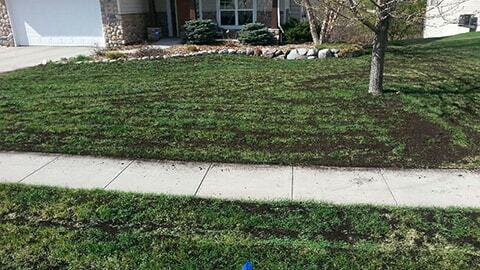 To boost the odds of a better looking lawn, Harbit also donated grass seed at each job. This “Green Rush” sprang from a $300,000 Soil Quality Restoration Project grant to the city from the state. The money came from interest savings on a $21-million wastewater plant expansion in the New Liberty. Each homeowner got up to a $1,500 reimbursement for the costs of restoration. The goal isn’t just beautification. The main purpose is better storm water management. With North Liberty growing at a rate of about 1,000 residents annually, new streets and roofs speed more water toward creeks that are already prone to flash flooding. Soils high in clay worsen the problem, common in urban developments, leaving homeowners with the challenge of growing lawns on subsoil compacted by construction equipment. The elixir for these ailments is compost in combination with the deep tine aeration, a first step in rebuilding organic matter that made up as much as 10 percent of soil when native prairies blanketed Iowa. “Some yards in North Liberty have virtually no organic matter,” says Amy Bouska. Bouska is an urban conservationist for the state of Iowa based in Iowa City. The goal is to rebuild it enough to absorb just over an inch of rain. “If we can reduce the amount of runoff we have, then we reduce the amount of pollution in the stream,” Bouska adds. The same concept is accurate for rural landscapes. Farmers are working to build organic matter – or improve soil health, to improve crop yield, reduce compaction and erosion, etc. The net result on stormwater is the same in both landscapes – increasing organic matter improves infiltration and decreases runoff. Doing so helps slow the flow of water to streams. This in turn helps reduce peak streamflow or flooding, reduces streambank erosion and means less sediment and less phosphorus entering streams. North Liberty’s lawn improvement project can potentially be replicated in other cities and watershed across Iowa. Replication will help to improve infiltration and reduce stormwater runoff. Tracey Mulcahey, North Liberty’s Assistant City Administrator, organized the soil quality project. And she volunteered her yard as a demonstration plot for three of the landscapers. One year later, “for the first time in 11 years we have grass growing on our hill,” she says. Last year, she worried that the city might not use all of the grant money. Today, there’s a waiting list for future grants. Besides homeowner enthusiasm for soil quality, Mulcahey has also seen a modest economic boost for the landscapers. Lucy Hershberger and her husband, Mike, who run Forever Green, were already installing rain gardens and other water controls. The soil quality project gave their business more exposure, Lucy says. It boosts the odds that homeowners will want more landscaping if they have a healthier lawn. “It’s increasing the enjoyment of their yards,” she says. For Sean Pearl, who with his wife started Sustainable Landscape Solutions a year ago, the project was a perfect entry into the community because of the awareness it brought. “For being a new business, the awareness was extremely beneficial to us,” he says. Even though the grant money is gone, the city does have other smaller cost-sharing programs and Pearl believes some homeowners will want to apply more compost. “If you can do this several years in a row, you’ll start benefitting the soil profile,” he says. For Harbit, the gains are easily quantified. 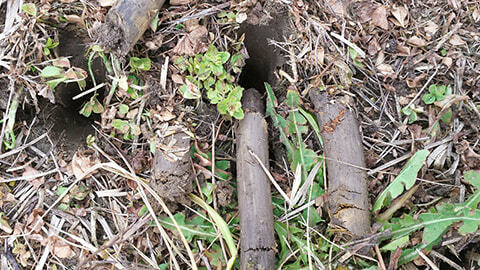 He already has invested in more equipment to specialize in soil quality restoration. “The entire business grew by 64 percent last year. That’s huge,” he says. As a result, the City of North Liberty and local landscapers worked together to add organic matter to new and existing construction. Through a combination of deep tine aeration and compost, the increase in organic matter will help slow the speed of rain water toward streams, reducing flooding and nutrients in water. Compost in the back yard has not yet been integrated. 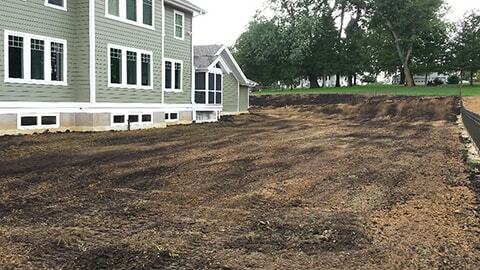 Adding compost to existing construction and lawns.